Researchers discover a new type of ‘memory’ immune cell. Researchers from the Garvan Institute of Medical Research have discovered a new population of ‘memory’ immune cells, throwing light on what the body does when it sees a microbe for the second time. This insight, and others like it, will enable the development of more targeted and effective vaccines. The opensource study is published in the journal Immunity. The team explain that two of the key players in the immune system are white blood cells known as ‘T cells’ and ‘B cells’. B cells make antibodies, and T cells either help B cells make antibodies, or else kill invading microbes. B cells and killer T cells are known to leave behind ‘memory’ cells to patrol the body, after they have subdued an infection. The newly identified ‘Follicular Memory T cells’ are related to the T helper cells but unlike circulating memory B and T cells, they position themselves near the entrance of lymph nodes, particularly those that are potential sites of microbe re-entry. The team add that humans have evolved an astonishing way of dealing with infection and that when a microbe containing ‘antigens’ (parts of the microbe that trigger immune responses) penetrates the skin, it quickly gets transferred to the person’s lymph nodes, which are interspersed throughout the body. The researchers state that lymph nodes are purpose-built structures for trapping microbes and manufacturing the antibodies needed to neutralise them. They contain clearly demarcated zones, populated by different kinds of immune cells, carrying out specialised tasks. When a microbe arrives at the lymph node, it is trapped by sentinel immune cells, called subcapsular sinus macrophages, which have evolved to act as ‘the flypaper of the lymph node’. This sets off a chain reaction that results in the formation of a ‘germinal centre’, from which antibody-producing cells are made. Before this can happen, B cells have to be able to perceive the microbe and then pass a number of quality control filters to ensure only those cells best able to make neutralising antibodies are selected. A subset of T helper cells, known as Follicular T helper cells, are critical for the antibody response because they help B cells navigate through these quality control filters. This process, from the arrival of a microbe to the creation of potent antibodies, is known as the ‘primary antibody response’ and is already well studied and described. The current study examines the ‘secondary antibody response’, when the body next encounters the same invader. The data findings demonstrated that Follicular T helper cells behave very differently during the primary and secondary responses. The team observed that during the primary response Follicular T helper cells are confined within the germinal centre; during the secondary response they are free to leave the germinal centre and surf the lymph system in search of memory B cells to activate. The researchers tracked the primary and secondary immune responses in mice, by using a laser to tag the cells deep inside the lymph node and then follow them with a special microscope that can be used in living animals. The lab state that what they saw in the secondary response was surprising. The team realised that the memory cells weren’t coming from the blood, as expected. They were already in the lymph node, and only in the lymph node closest to the original site of infection. This is important, say the team, because until now people have thought that memory is provided by circulating cells. In addition to the memory cells that are on patrol in the circulation, the current study shows that the immune system also leaves behind a garrison of memory cells, follicular memory T cells, strategically positioned at the entrance of the lymph node to screen for return of their particular microbe of interest. The researchers state that they could see the follicular memory T cells talking to subcapsular sinus macrophages, the highly specialised flypaper cells that trap antigen, checking their catch to see if it was of interest. The findings noted that when the memory cell sees its target on the macrophage, it becomes activated and the cell divides to start making a new army of Follicular T helper cells. This second generation of Follicular T helper cells is then sent out via the lymphatic system to other parts of the body to fight the infection. The team surmise that the subcapsular sinus macrophages are incredibly important to the process. Understanding how to target antigen to them, and in turn to the memory cells, will help make better, more effective vaccines, adding that the more insight the medical community have into these complex processes from a whole body perspective, the better. 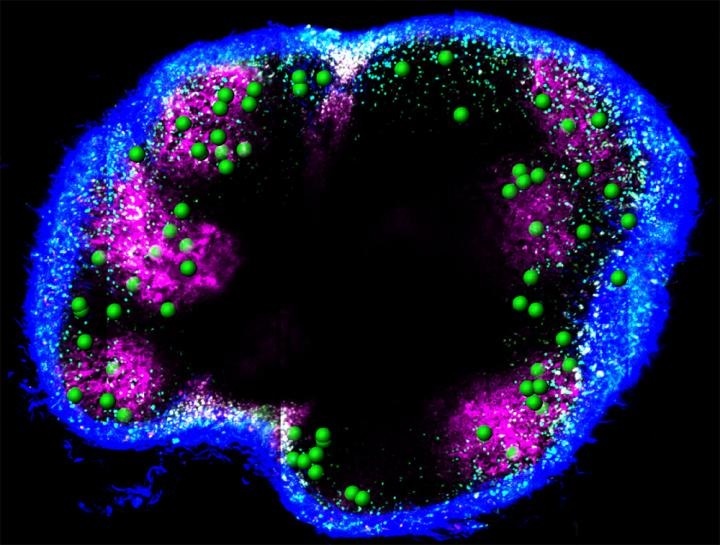 Two-photon microscopy 3-D mosaic tiled image of a lymph node, shows the location of follicular memory T cells (represented by green spheres) in the B cell follicle (magenta) near the capsule (blue). Credit: Garvan Institute of Medical Research.